Just an everyday scene in Menton. 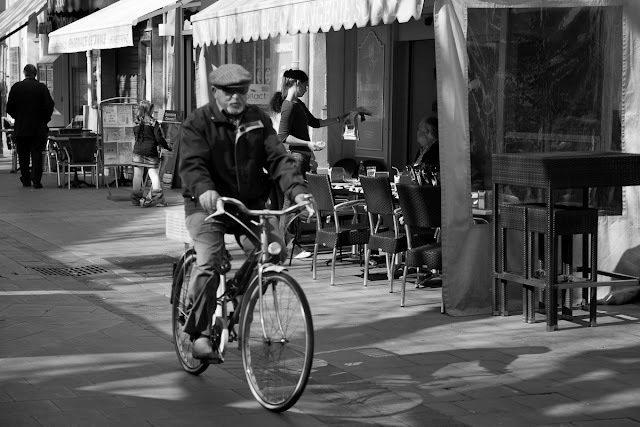 An old man on a bicycle rides past the patisserie, the waitress picks up a newspaper and chats to a customer, a child is on a scooter waits for her mother to come out of the pharmacy ... and the sun shines. That's Menton! Juste une scène quotidienne à Menton. Un vieil homme à vélo se promène dernière la pâtisserie, la serveuse prend un journal et parle avec un client, une enfant sur ​​une trottinette attend sa mère à la sortie de la pharmacie ... et le soleil brille. C'est Menton! Did you turn your camera on the dial to take the photos in black and white, or did you use a separate program to convert color into black and white? This seems to be rich black and white color. Not converted. So if you did convert, what program did you use? I use Lightroom. I simply changed the image from colour to black and white and then added extra contrast. Sorry meant to say, didn't make the change in the camera. Only in Lightroom. you so keenly understand that an ordinary day in menton is an extraordinary treat for our eyes. Dear Brattcat, yes I do but it's also a treat for me too, even tho I live here. I love seeing Menton through your lens. I definitely want to visit there someday. Ordinary days are definitely the best Jilly.